Each jar of our soothing lotion contains 99% pure CBD. Our CBD is lab tested to ensure only the best quality CBD is used in our products. CBD has been shown to help with stress, inflammation, anxiety, depression, nausea and insomnia. 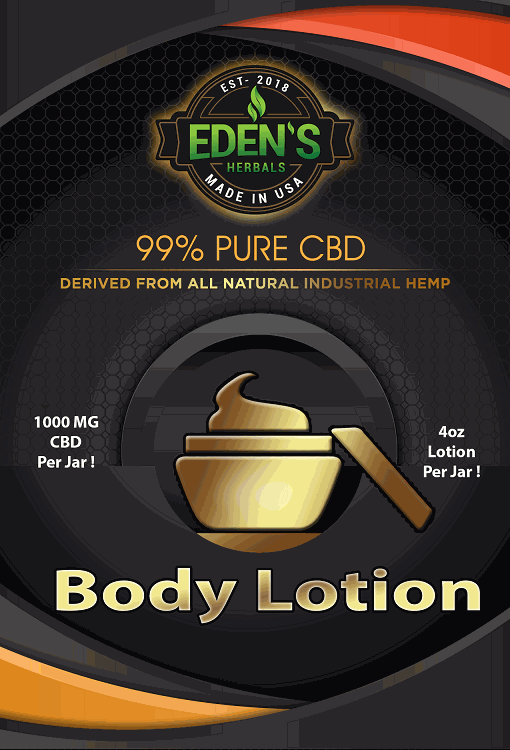 Contains 4 Ounces CBD Lotion per jar. Apply Lotion to sore or stiff joints, muscles, or bruises for quick relief and sustained hydration. Works great on arthritic joints, dry skin, cracking skin, and areas of dull aches and pains. Ingredients: Purified Water, Propylene Glycol, Mineral Oil, Stearic Acid, Cetyl Alcohol, EDTA, Glyceryl Stearate, Aloe Vera, Triethanolamine, White Protopet, Dimethicone, Propyl Paraben, Methylparaben, Allantoin, Carbomer, Propylene Glycol, Diazolidinyl Urea, Iodopropynyl Butylcarbamate, Essential Oils, and Cannabidiol (CBD) Isolate. Fragrance: Eden's Oasis Essential Oil. AVOID CONTACT WITH EYES - IF CONTACT OCCURS, FLUSH IMMEDIATELY.